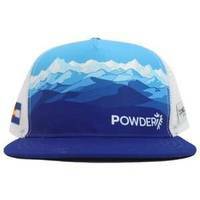 With local artwork from Sarah Beabout, this Powder7 Peaks Trucker is sure to catch some eyes around town. Hand drawn by Sarah herself, these peaks represent the rugged Rocky Mountains of Colorado. With Powder7 being nestled into the foothills of the Rockies, these peaks have a special place in our hearts. Complete with a Colorado Flag patch to stitched onto the side of this cap, every detail is thought out and made just for you; Our Powder7 fans. Made by BOCO Gear out of Boulder, this technical trucker is ideal for all your adventures with wicking material to keep you dry. Whether rocking this cap to and from the ski hill, or sporting around town, this is sure to be your go-to hat this season.